Price List USTents primarily rents out frame tents. Frame Tents are versatile and highly durable which provides the cutomer with a nice quick installation and dismantling times. Our Frame Tents do not have any poles in the center of the tent. Our frame tents have wide open space in the tent. The legs are spaced every 10 to fifteen feet depending on the size of the tents. The legs are only along the perimeter of the tent. 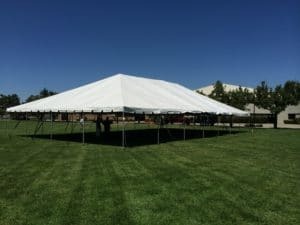 USTents currently offer tents from 10×10 to 40×100. USTents sets up the tent takes the tent down all included in the price ! There is free delivery depending on your location and the circumstances. USTents is part of Big B Tents and Big B Enterprises. Call or text 209-652-6616 for more information.